This quaint little design house on Koramangala’s 5th Block is home to lehengas, dresses, sarees, and pretty accessories to pair with your outfit. 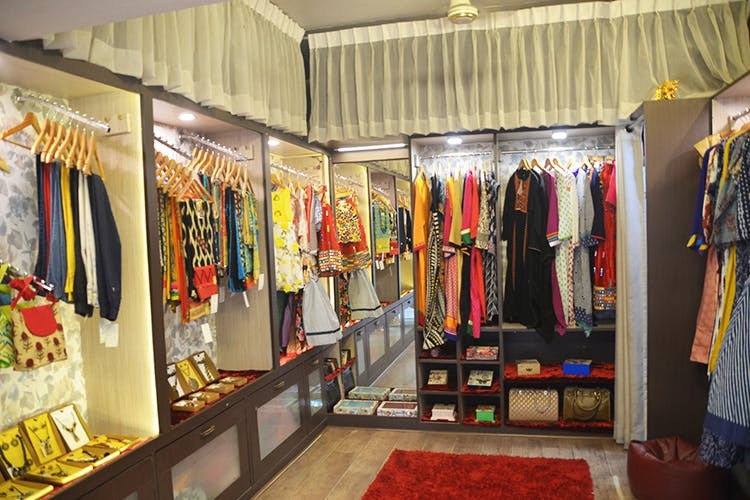 A quick look around the store and you will see an interesting collection of kurtis, dresses, sarees, kid’s skirts and tops, and ethnic occasion wear. Priced as low as INR 1,500, there’s plenty for you to score in case you are looking to upgrade your wardrobe or on the look-out for pretty but pocket-friendly dresses. When we snooped around the shop, we found quite a lot of kurtis done up in all kinds of style ranging from knee-length to short ones in prints such as ikat, paisley, and other block prints. We even spotted a few kurtis with mirror work, bling, and all that jazz as well. Looking to stand out? Well, you know where to head now, right? There’s even a changing room in the store, so should you fancy some cool tops, you can try them on and see if they are a good fit. Accessories are mainly terracotta and metallic jewellery, purses, and handbags. These start at a little over INR 500. It’s the bespoke studio concept along with the pocket-friendly prices that make this store a hit with us. Everything from a simple blouse to an intricately designed lehenga can be ordered here at the stitching centre next to the store. Now, while the prices depend on the work itself, say you have a Bollywood-inspired outfit in mind along with a budget, these guys can work it out. The ‘budget’ part in their name not only stands for pocket-friendly but also for working on a budget. The store also stocks up on fabric, but you are more than welcome to bring your own material as well.